Maximum of 7 people per group. Starting time and location of the lessons may vary according to weather conditions, but it is very unlikely we will not find good waves to surf. Toilet, shower, restaurant, and shops close to the starting point. School offers storage for students. What to bring: only the clothes you would usually wear on the beach and towels. The transfer is free if your accommodation is in Maspalomas, Meloneras, San Agustin, or Playa del Ingles. Otherwise, a 5 euros fee applies per accommodation. It means if your group is all in the same hotel, you pay only 5 euros for everyone. On rare occasions, the course may need to be postponed due to bad weather. In these circumstances, we will offer you alternative dates, or we will refund you 100% of the paid amount . There is a reason surfing is considered one of the most addictive sports out there. 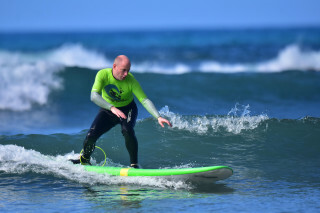 Once you get you first green wave - meaning to stand up on the board and smoothly glide your way to the shore - you will probably be hooked forever. There is no way back! Now, imagine a place with beautiful beaches, good waves and pleasant water temperatures throughout the year. This is the Spanish volcanic island of Gran Canaria, that counts with 2,000km of coastline, sandy beaches and astonishing mountainous landscape all along its territory. Sounds like a good place to take your first surfing lessons? Our surfing school is located just 50 meters from the beach, at Faro de Maspalomas. This is a perfect spot to take your lessons. We can always find spots with consistent waves for beginners. Even during the flat days, we can move to a different place where we can certainly find good condition for your lessons. Usually your day starts at 9.30am, with your guide picking you up from your accommodation about half an hour before the training session starts. The starting time may vary according to the sea tide, so your certified instructor will arrange the right time with you a few days in advance. Once you get to the starting point, you see that the lesson happens mostly in the water. We don’t waste time with things that don’t matter. The only time we spend out of the sea is during the indispensable safety briefing and quick theoretical explanation. It doesn’t last more than 15 minutes. After that, you gear up and jump in the sea for some action. This is a dynamic course. In case you have any sort of difficulty, your professional instructor is there for you. If needed, he takes you to the shore for a short explanation of how to improve your posture to finally get a green wave. You will be amazed about the things you can do on the board. Once the training session finishes, we return to the school for a debrief. This time, your instructor explains to you what you have to do in order to continually improve your skills. Our surfing course is available in one, three or five days. 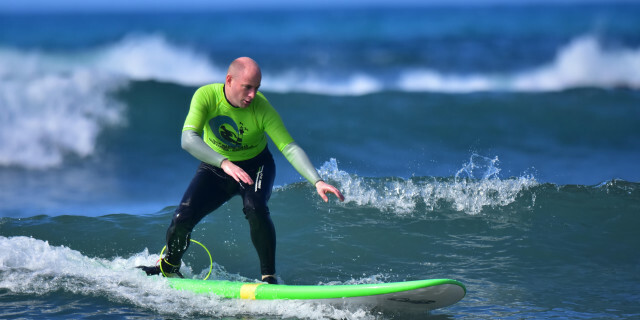 Each session lasts two hours and focuses on the skills that you still need to develop to become a better surfer. With a mixture of a fantastic place, terrific views, amazing sport, and a new passion, it will be hard to say goodbye to Gran Canaria. 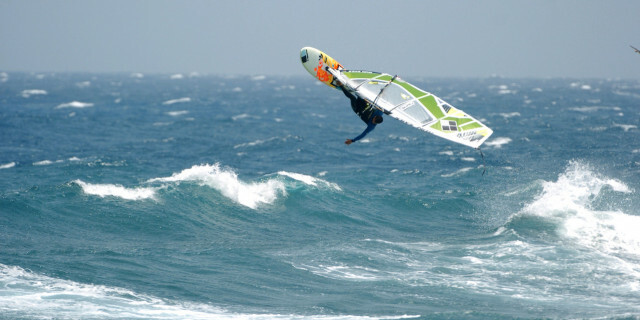 Learn windsurfing on a beach that offers perfect conditions for beginners. Take lessons with certified professionals.